Can ambitious mums really have it all? Is there really an alternative to the age-old battle between your career and your family? 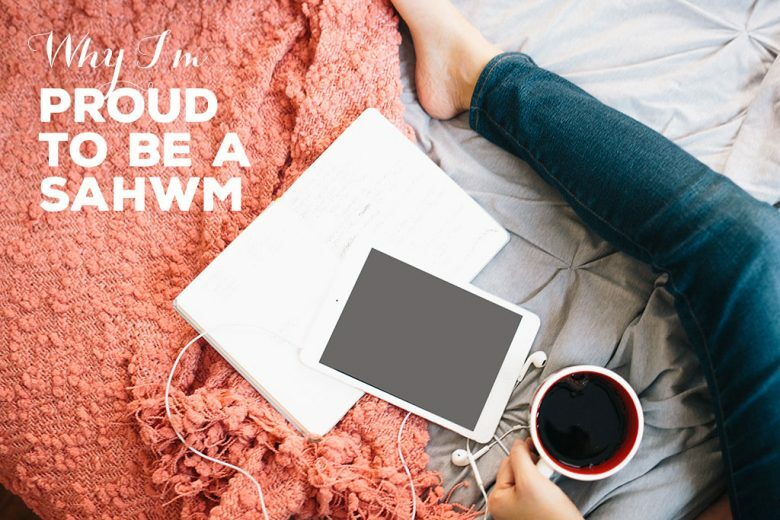 One fulfilled working mum believes there is – it’s SAHWM. Freelance writer and communications expert Rachel Mostyn explains why she doesn’t relate to either the working mum or the stay at home mum label – and why being a stay at home working mum (SAHWM) feels a much better fit. I’ve never been quite sure where I fit. Three children later and I neither consider myself a stay at home mother in the traditional sense or a working mother. Of course the traditional ‘Mummy Wars’ of the suited and heeled career mothers hurriedly dropping at the school gate versus the calm (!) stay-at-home smiling mothers feel just a little out of date. But that said the middle ground has always been a little shaky. I’m mostly there at the school gate with the gaggle of other mums in my jeans and converse, drowning in scooters and school bags. I’ve also not used much after school child care. But equally I consider myself to have a career just as much as that traditional stereotype of a ‘working mother’. I’m a journalist and media trainer . I essentially work from my office at home and as far as possible try to make it work around the children. 5.30am is my friend. Those wee small hours where the only sound (touch wood) is me tapping at my keyboard are a joy. I’m nearly always there after school for the kids. Of course my phone is never far away and I’ll admit there have been many occasions where I’ve locked myself in the shed/loo/a cupboard to take a work call. And I just ignore the old wives’ tale of children getting square eyes when I’m on deadline. But just recently I’ve found a title for myself that feels finally like a good fit. Like many other mums I’m a SAHWM (pronounced saw hum apparently). That means I’m a ‘Stay-at-home-working-mum’. I’m one of a rising number of women who are choosing to work flexibly and therefore not miss out on kids or career. And I definitely tick all the boxes. I make school assemblies or end of term plays and I know way too much about Nerf guns. Yet I’ve also had a fulfilling career since my first child was born eight years ago. And I believe the refusal to choose between the two is what has kept me working. A recent survey from the organisation She’s Back found 70% of women who left the workforce did so because they found it impossible to combine their career and family life. Three quarters felt there was just not enough flexibility. At least this way round I have (just about!) managed both. I’ve basically refused to choose between career and home and most of the time it has worked out. Of course there are days and nights when I’m pulling out my hair as the baby/toddler/cat/husband refuses to sleep. I’m also not massively proud of the fact I was in such a rush to plant some flowers with the children during ‘quality time’ recently that I ended up burying my phone at the bottom of a flower pot. Equally ‘switching’ between professional woman and mother without much time to breathe in between can also occasionally be embarrassing. Not great when you mistakenly call a male colleague ‘sweetie pie’. Of course there are also days when I work away from home and these are cherished days too. I get to finish sentences and drink whole cups to tea without them getting cold. But then the next day, work time may be punctuated by fat little arms grasping around my neck. And it’s for that reason alone I’m a SAWHM and proud of it.